After being activated for Fall 2015 term, you will receive a Term Activation Email that will give you information on logging in to your ConnectCarolina Student Center to view your enrollment appointment, search for classes and add classes to your shopping cart. It is helpful to read that email. 1. Go to your ConnectCarolina Student Center. 3. Click on the Open Enrollment Dates link. 4. Select the 2015 Fall term and click Continue to view your enrollment appointment date and time. Enrollment appointments for Fall 2015 begin on Tuesday, April 7, 2015 and follow the registration schedules posted on the University Registrar’s Fall 2015 Calendar. Enrollment appointment dates for undergraduate students are assigned on the basis of terms in residence. A semester is tallied for each full multiple of 15 cumulative transfer‐credit hours awarded for courses taken at other colleges. Excluded from this calculation are transfer hours awarded for courses taken either concurrent with high‐school or in any summer term after your first term at UNC Chapel Hill. Any term in which you are enrolled only in online courses does not tally as a semester used up. Important: Make sure you clear any holds on your account preventing enrollment, prior to your enrollment appointment starting. Go to your ConnectCarolina Student Center. Locate the Holds section on the right. If you see “No Holds” listed, you do not have any holds on your account. If you do see Hold(s) listed, click on the Details link for more information on the holds. You can now search for classes and add classes to your shopping cart. You may add as many classes as you would like into your shopping cart. Important: When adding classes to your shopping cart, make sure to follow all the steps until you receive the message that the class has been added to your shopping cart. There are many different ways to search for classes. If you’re looking for additional search options, try using the Additional Search Criteria. 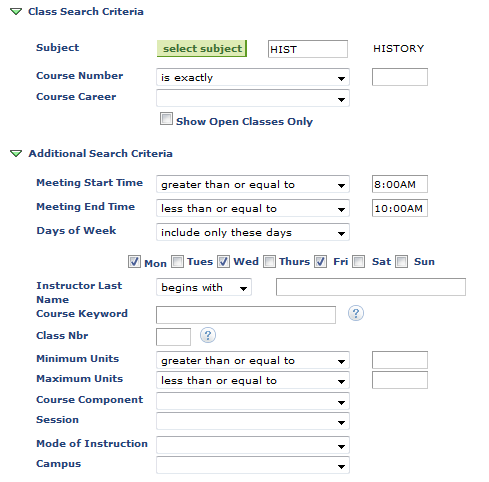 If you’re looking for a History class that meets on Mondays, Wednesdays and Fridays between 8am and 10am for example, you can put HIST into the Course Subject field, then populate the Meeting Start Time, Meeting End Time and Day of Week fields and click the SEARCH button. Be sure to read the Class Notes on a class for more information about the class as well as any notes about seats that may be reserved. If a class has Class Notes, you can view them by clicking on the Section link from the search results, and then looking for the Class Notes section. When adding variable credit classes to your Shopping Cart, be sure to adjust the Units field prior to clicking next button. Once the class has been added to your Shopping Cart, you can also readjust the credits, by clicking on the class again. Once your enrollment appointment starts (view Tip #2 to find your enrollment appointment), you may begin your registration. Keep in mind that this is just the beginning of your registration, and students will be changing their schedules up through the online add/drop deadlines. Check out our registration calendars at https://registrar.unc.edu/academic-calendar/ for important registration dates. If you have questions about classes you cannot get into because seats are reserved, try contacting the teaching department for more information. If you are looking for additional classes, but need guidance on what to register for, contact your advisor for more information. The Registration Guide is the complete resource for assisting students registering for classes at the University of North Carolina at Chapel Hill.